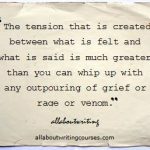 Here’s a short, sharp piece of advice for writers who are encountering difficulty beginning a story. Let me set the scene. You’ve been playing with the idea for a new story – long or short – for the past little while. You have a fix on the characters involved in the opening. You have several ideas for possible opening scenes. You’ve played with writing it in the first person: more intimate, more emotionally direct. But you’ve also considered the third person. You’re concerned also about the tone you’ll adopt. Will there be a slight satirical undertow, or will you avoid social commentary entirely? Will your voice be warm and colloquial – or quirky, even spikey? How will your protagonist talk about her brother/husband/best friend? In terms affectionate, or slightly critical? Will there be a touch of jealousy in her tone, or admiration? Or both? In short, you’re confronted by a range of choices that you have to make. Your story will unfold in very different ways depending on the choices you make now. My suggestion is… Do them all. Try an attack on the story using the first person. Inhabit your character. Write from her heart and the intricate interstices of her brain. Then write an opening in third person. Watch events unfold from the slight distance that this point of view gives you. But still take care to colour the perceptions of her world with her unique perspective. Then take a step back and think, where else might you begin the story? Not on the day of the explosion, but the day after, when your characters are trying to make sense of the events that blew their world apart. Don’t mention the explosion. And so work your way through the various alternatives that make sense to you. Try that satirical edge, if you like. Massage your character so that she becomes a little more eccentric. Give her, in these opening stanzas of your piece, a really sharp and acidic tongue. Don’t stop just because you’ve written one opening scene that you’re rather enamoured with. Write three, four, five – a dozen versions. You’ve got the time. You’ve got the imagination. And you’ll discover a few very interesting things as you work your way through your various alternatives. You’ll discover, for instance, that knowing that you’re “just practising” will dispel those opening page nerves that so often inhibit us beginning a story. You’ll discover that the obvious approach is not necessarily the most entertaining, dramatic or suspenseful approach. And you’ll discover that giving your protagonist different tones and voices will tell you a great deal about her that you hadn’t known before.